Cookies are also used on this site to make it more secure. “This is a great venue. I have really, really enjoyed playing here.” Martin Simpson. 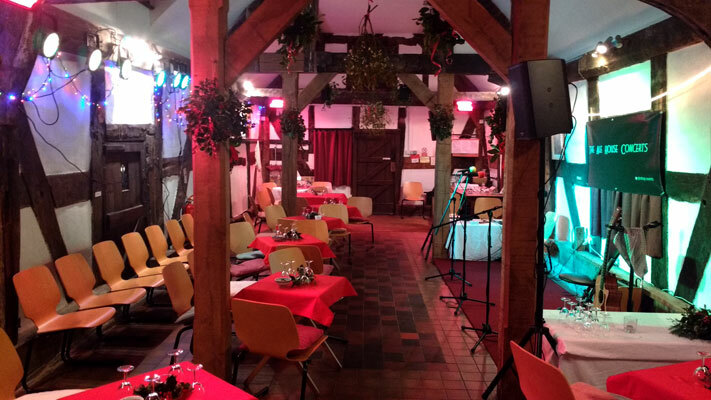 “I really like this little venue.” Pierre Bensusan. 4th May 2019, 8 p.m.
We have a mailing list. If you would like to be informed in advance of our events please contact us with your email address. 15th December 2018, 8 p.m.
21st July 2018, 8 p.m.
19th May 2018, 8 p.m.
28th April 2018, 8 p.m.
24th March 2018, 8 p.m.
2nd December 2017, 8 p.m.
1st December 2017, 8 p.m.
13th October 2017, 8 p.m.
16th September 2017, 8 p.m.
6th May 2017, 8 p.m.
8th April 2017, 8 p.m.
17th December 2016, 7:30 p.m.
3rd December 2016, 8 p.m.
23rd September 2016, 7:30 p.m.
21st May 2016, 8 p.m.
23rd April 2016, 8 p.m.
11th March 2016, 8 p.m.
10th December 2015, 8 p.m.
27th November 2015, 8 p.m.
19th September 2015, 8 p.m.
20th June 2015, 8 p.m.
16th May 2015, 8 p.m.
25th April 2015, 8 p.m.
21st March 2015, 8 p.m.
21st February 2015, 8 p.m.
20th December 2014, 8 p.m.
22nd November 2014, 8 p.m.
8th November 2014, 8 p.m.
18th October 2014, 7:30 p.m.
27th September 2014, 8 p.m.
20th September 2014, 7:30 p.m.
17th May 2014, 7:30 p.m.
Saturday 23rd April 2016, 8 p.m.
"Yet another great night at the Ale House"
"Enjoyed Jess - incredible storyteller and songwriter"
"Jess Morgan: wish I could play guitar like that! Never heard of her before. Fab evening of music from you all. Many thanks." Jess Morgan is a songwriter’s songwriter. Constantly touring, constantly writing, constantly striving to do better, to be better. Inspired by storytelling songwriters like Nancy Griffith, the playfulness of Devon Sproule and upfront British voices like Billy Bragg, expect a tumbler of unfancified roots music – with heart, with passion, with gusto. 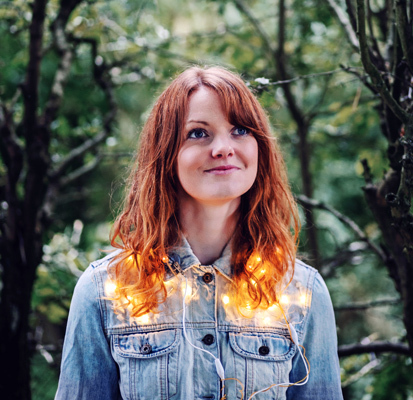 Over the past few years Jess has been making a noise in the UK and further afield with a string of albums comprised of acutely observed, beautifully delivered country-folk ballads; song about travel, about people, about history, about love, about whatever the song needs. The songs are intimate, but not in that earnest, quiet way. There’s fire in Jess’ voice, the way it soars between notes like a bird in flight. It’s intimate, but it’s end of the night, lock-in at the bar, let’s get the nice whiskey out, intimate. ‘The Bournemouth EP’ was released to vibrant acclaim in Summer of 2015.The entire first run of CDs, dressed in tactile limited edition packaging, sold out in less than a day – a triumphant follow up to the the full-length album ‘Langa Langa’ which attracted the ears of the BBC Radio 2 Folk Show, Bob Harris Sunday, BBC 6 Music, Folk Radio UK, R2, Uncut and The Telegraph. 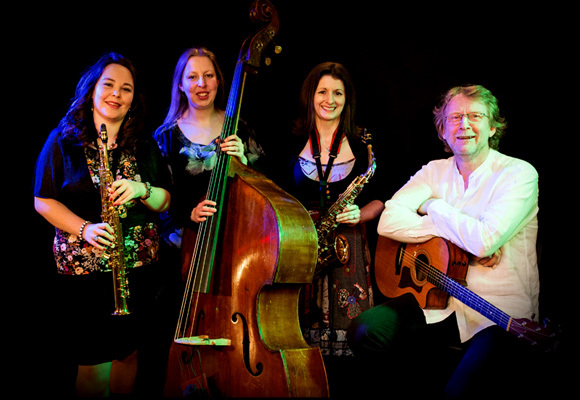 A quartet of guitar, saxophones, flute and double bass, Appleby Kinsey continue to create a distinctive, natural acoustic sound, with rich melodies, beautiful original songs, and masterful playing. Hannah West joined the group in January 2016 as double bass player. Hannah is a talented and versatile musician, multi-instrumentalist, singer, teacher and composer. Talitha Cole and Emma's Stone's voices combine in beautiful harmonies over lyrical, catchy, original songs in a variety of styles, from Latin jazz to folk. Since 2010 Appleby Kinsey have been playing weddings, festivals, cruise boats, bars, restaurants and have a dedicated following in the region. They have a large repertoire of original songs in various genres ranging from cool jazz to straight pop and contemporary folk, using an appealing mixture of these styles. They have released one album, ‘Begin Again’ on CD and download, containing 14 original songs. Tracks from ‘Begin Again’ are regularly played on BBC Local Radio. 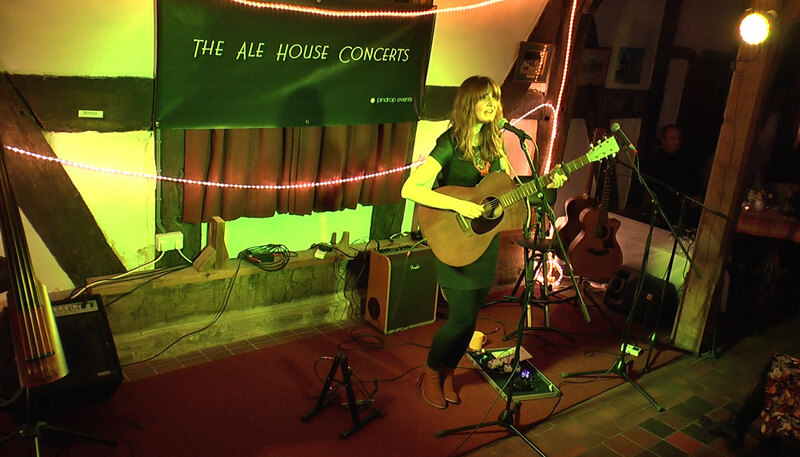 The Ale House is a delightful and intimate concert venue, with warm acoustics. Despite its name, there are no bar facilities at The Ale House and events there do not normally make alcoholic drinks available for sale. Most events, however, are bring-your-own. Wine glasses are made available. 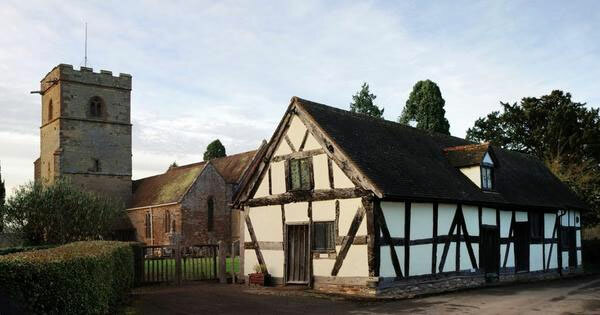 In the 16th Century The Ale House was a place to serve ale to the parishioners of Colwall after church services. Nowadays, while having all modern facilities, it retains its ancient charm, with oak beams and leaded windows. It is situated adjacent to St James the Great Church in Colwall. From the main B4218 going through the main part of Colwall, turn down Mill Lane, which is just north of the railway bridge. Go past Colwall Village Hall and the church is about half a mile further down the lane. Park in the large car park next to the church and walk through the churchyard to the Ale House. For reasons of safety parking is not allowed immediately adjacent to the building. The Ale House is fully equipped for wheelchair access. There is a pull-in space by the main door at the south end of the building (shown in the picture) for drop-off.